I love the taste of Celery. Imagine my shock when I came to realize that Celery root is a vegetable that comes from the same family as the celery plant and it is not the root portion of celery. 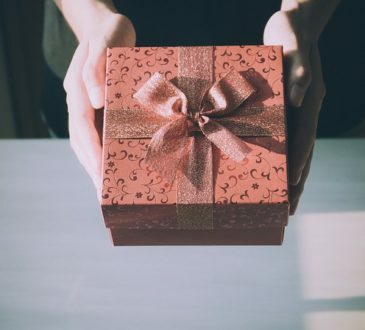 For many centuries, it was grown and bred by Italian and Swiss botanists, and was developed for its root, which is a large, round bulb with gnarly, light-brown skin. The inside is white with a hint of pale green. We can all concur that not many vegetables are as ugly as the celery root. This may be the key reason why people tend to ignore it, in addition to not knowing much about it. But like most things in life, the true goodness of celery root is hidden in a most unlikely package. Underneath the gnarled looking root with its nooks and crannies of its brown, hairy exterior lies its smooth emerald white interior, a very nutritious addition to your rich stews, purées, crunchy salads and green smoothies. I found that Celery root has a distinct taste, more of a mix of the great celery with a hint of parsley, and a touch of nutty, but without the stringy fibers of celery that get stuck between your teeth. It looks like a lumpy rutabaga or turnip, and behaves a bit like a potato when it’s cooked. It has significantly less starch and way more vitamin B6 than a potato, so don’t shy away from thinking of it as a healthier potato. Celery root contains no cholesterol or fat, and is an excellent source of your natural dietary fiber. It is also a good source of iron, vitamin C, calcium, phosphorous, potassium. 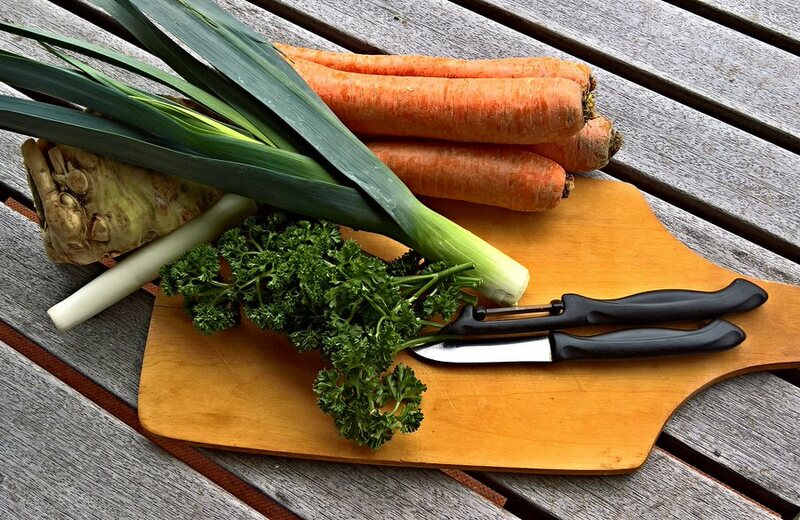 Also known as celeriac, celery knob or sellerie, it is a simple and versatile vegetable to use, cooked or raw. The peeled root can be sliced thin, julienned and used fresh in a salad, or the root can be boiled or steamed. The root can also be boiled and pureed with potatoes or cut into chunks and added to soups and stews. If your recipes call for celery root and you have none at hand, no sweat. There are a number of natural and wholesome alternatives that are readily available in your kitchen, local grocery or supermarket, that are good substitutes for celery root. Parsley Root Parsley root is similar in appearance to a parsnip, owing to its tapered shape, light beige skin and rough furrowed texture. It does have a different flavor and nutrient composition though. Crunchy and tender when eaten raw, it is smooth and creamy when cooked. The taste of parsley root is compared to a combination of celeriac, parsley and carrot. Aromatic with a strong flavor, it can also be used as an herb. Parsley root nutritional profile is impressive. High in Vitamins A, C, K, iron, and other minerals, it also has high folate and dietary fiber content. This makes it a very good dietary addition to your weight management. It is known to reduce flatulence, detoxify the body, protect heart health, and strengthen the immune system, among others. The versatility of Parsley root makes this -a good substitute for celery root. 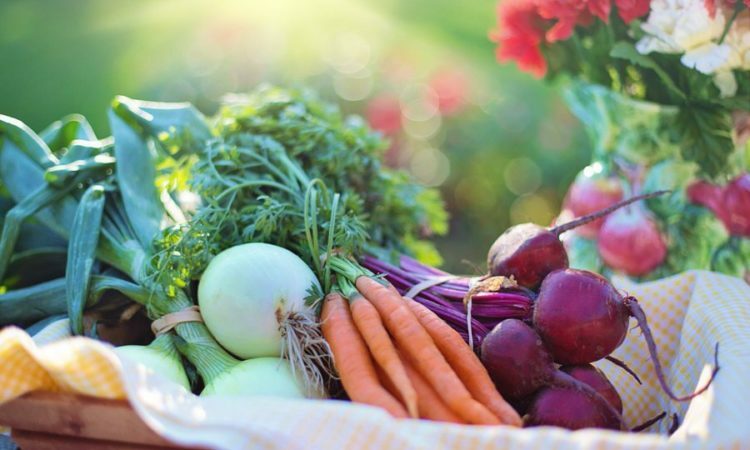 Treated similarly as carrots, it can be eaten raw, sliced up or grated in raw, or baking, sautéing, steaming, or boiled with potatoes for flavored mash, or ground up for a flavorful spice in marinades and spice blends. Try a combination with chicken or beef for soups or sauces for heartwarming meal. A milder substitute for celery root, celery has wide parsley-like green leaves and thick, juicy, ribbed stalks that join at a common base above the root. Its stalk has a juicy and crunchy flesh with a mild salty flavor. 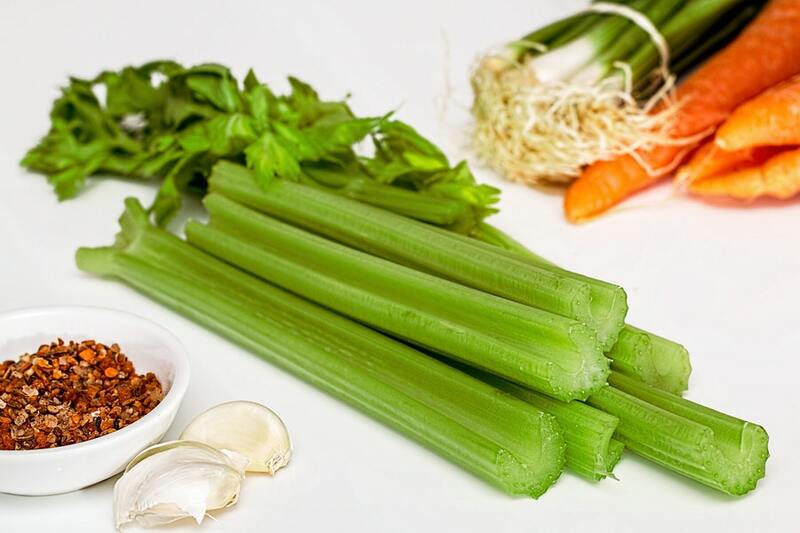 Although celery is most often used for its stalks, while the leaves are edible and seeds filled with a concentrated celery-flavor. Originally from the Mediterranean region, this vegetable has a high water content, and is packed with numerous nutrients for your benefit. Vitamins A, C, folates and dietary fiber, minerals, all make this a healthy addition to your soups, purees, and gratins. It is also eaten raw, with citrus segments and grains for a cold salad. A great way to enjoy this perfect low calorie substitute for celery root is in tuna or egg salad, and in stir fries mixed with carrots, bell peppers, and onions, and teriyaki or orange sauce. It also adds an aromatic flavor to pot roast and vegetable soup. 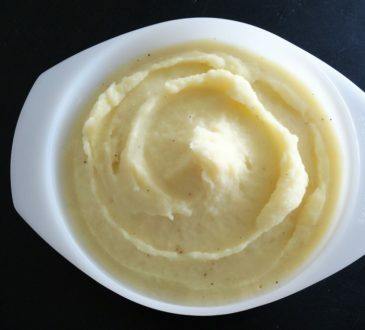 You may want to pulse it and use it in your puree’s for a healthy meal. I recently found out that there are many alternatives in my kitchen which I could use as a food mill when my blender is not working. See the various items I use in my kitchen to pulse food here. Common turnips are made up of edible roots, stems and leaves. 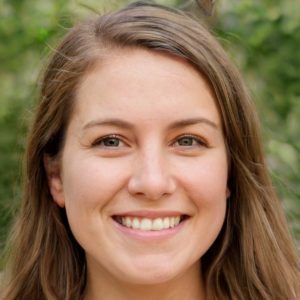 What we commonly find in the grocery stores is the trimmed round, apple-sized root vegetable, white at the bottom with a light purple blush around the top. 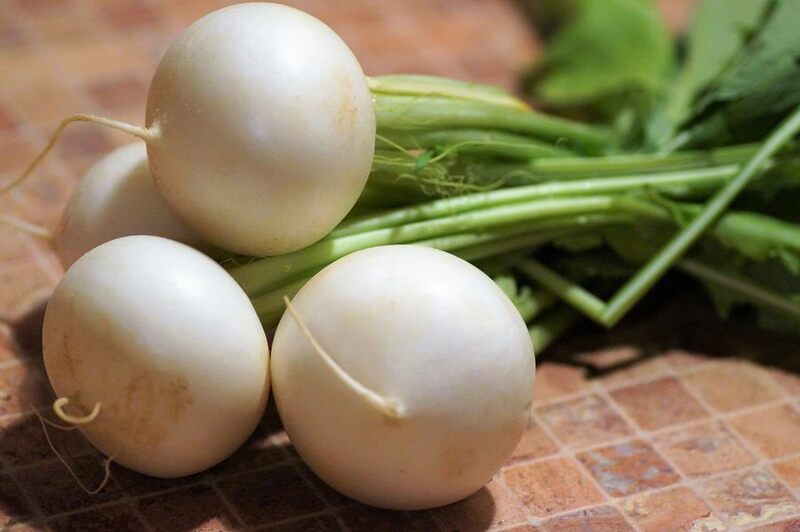 With a flavor and texture similar to radishes, Turnips have a bone white flesh that is firm, crunchy, and succulent with a sweet and peppery taste. Turnips are a good substitute for celery root due to their taste, and their versatility in various recipes. They can be eaten raw, though are nest when cooked, as the flesh softens and releases its rich and sweet flavor. Braising, simmering, slow roasting and sautéing is a popular method of cooking turnips, though they can be into smooth purées and soups. Check out the best blenders which make perfect soups and juices here. Turnips pair well with other root vegetables such as beets, parsnips and carrots, and with rich meats such as pork, beef, sausages and game. They also compliment ingredients such as butter, cream, cheese, chives, chestnuts, garlic, citrus, mushrooms, parsley, potatoes, tarragon, thyme and vinegar. With a name derived from the Germanic ‘kohl’ for “cabbage” and ‘rabi’ for “turnip”, the Kohlrabi is a plant related to cabbage, kale, and broccoli. The plant’s greens grow directly from its bulbous stem, can be sold with or without the greens still attached, though the former is more desirable. The flesh of the bulbs is white, regardless of the color of its outer layer and leaf ribs. Smaller bulbs are tender and have a milder, sweeter taste, while the larger bulbs can become more fibrous and woody. With a sweet and mild taste similar to cabbage or radish, and a flavor likened to broccoli stems, it is firm, crisp and juicy can be eaten raw, shredded for coleslaws or salads. Much like celery root, you are not limited in adding it to wide variety of recipes, such as cut in chunks for soups of vegetable stir fries, steamed in omelets and pasta dishes, baked, braised or roasted. Oh! Here is a list of some great food processors you can use to crush your kohlrabi when making soups or purees. 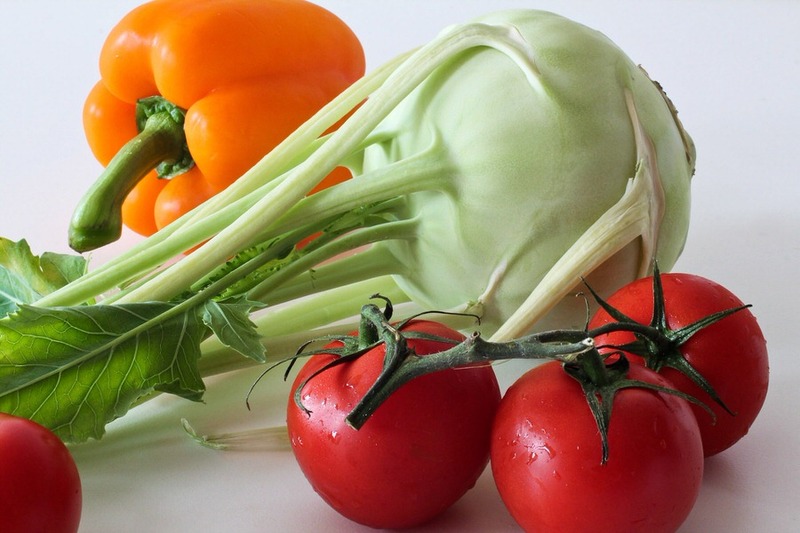 Kohlrabi is high in vitamin C and a good source of both fiber and potassium. This nutrient-dense bulb also contains high amounts of phosphorus, magnesium, calcium and iron. Also known as Jambean, it is not a very commonly known root, but is a perfect substitute for celery root. A little visually intimidating, this tuber can be large, with bark-like skin, giving you a perfectly juicy and crunchy experience. Jicama is similar to celery root, being is a juicy, sweet, and nutty tuber with a distinct crunch, much like a savory apple. Mostly enjoyed raw, you can cook jicama, briefly to maintain its crispy flesh. A jicama stick can stand up to a carrot stick any day — excellent on its own, or with a dip or vinaigrette. It makes for an excellent salsa, your perfect match for a tortilla chip or to top a taco. 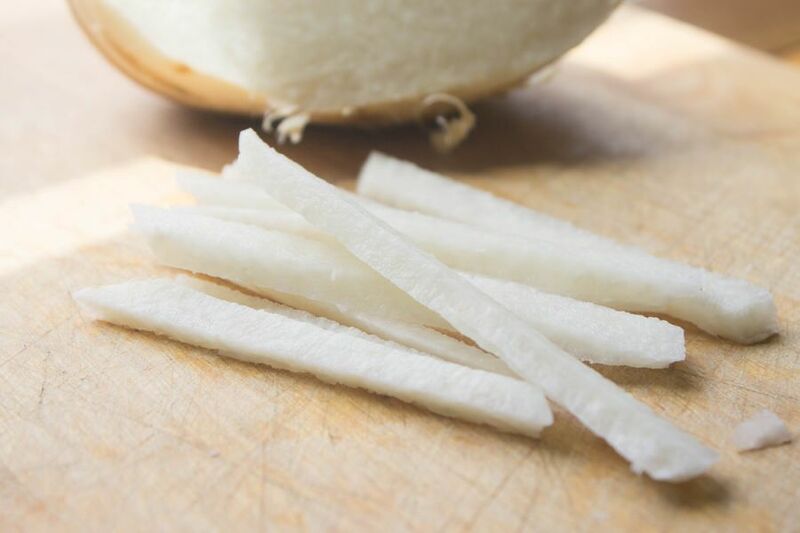 Cut jicama into slim sticks, then dice it finely. Combine the jicama with corn or diced tomato, black beans, a little red onion or scallion, minced jalapeno, cilantro, and lime juice. Thin strips of jicama make a great coleslaw with shredded red cabbage, carrots, and avocado, and healthy addition to any stir-fry. Try it with broccoli, garlic, ginger, scallions, and toasted sesame seeds or cashews. Jicama is highly beneficial, being a prebiotic and providing you with dietary fiber, vitamins and minerals. It is known to be low in calories, and has a very low glycemic index, making this a great substitute for celery root. 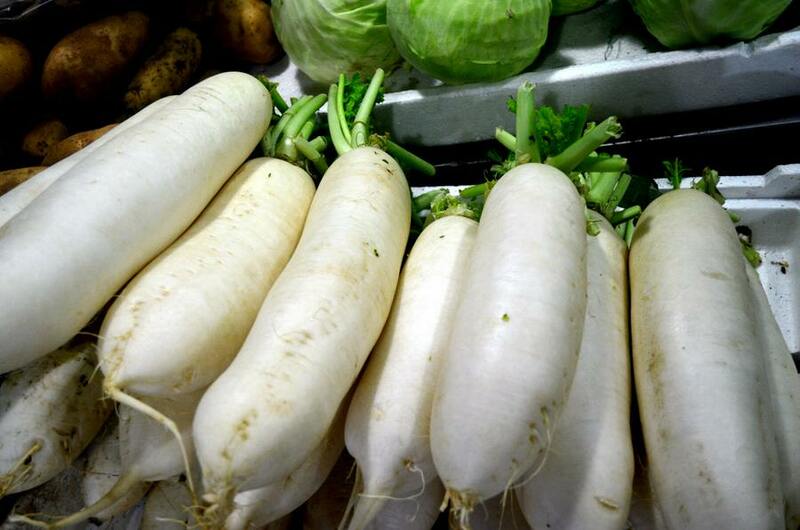 Daikon radish is a white fleshed tuber, also referred to as Japanese horseradish or mooli. Mostly grown for its root, the green tops are just as edible and versatile. The root of the Daikon radish is cylindrical with a white skin, similar to that of a carrot or turnip. 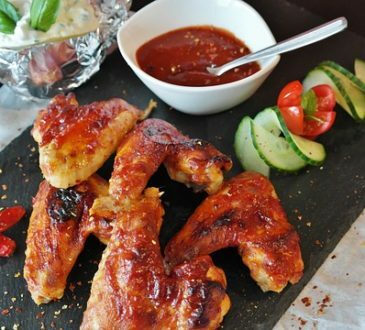 Featuring a less fiery flavor, it is juicy, with a mildly tangy taste. A staple and native of Japan, Daikon is a versatile vegetable that can be eaten raw or cooked. Shredded daikon adds crunch and a hint of spice to your salads and coleslaws. Paired with carrots, it makes a savory pickle, and when baked, makes the perfect chips. Cubed, it can be added to your pot roasts and other meat dishes. Daikon is known to provide you with a high concentration of enzymes that aid in the digestion of fat and starch. High amounts of vitamin C, potassium and phosphorus, it is not only a perfect substitute for celery root, but a great nutritional addition to your meals. There is a wide variety of substitutes for celery root, so your recipes will not be affected when this root vegetable is not available. 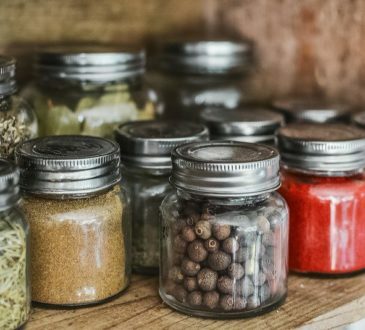 Some of these substitutes add even more flavor and nutrition, so go ahead and tantalize your taste buds with these health alternatives. FUN FACT: You can use any these substitutes to make your healthy juices and smoothies.